According to the french newspaper Ouest France, Chippen has visited the installation of the Football Club de Nantes this wednesday. He was with his wife (?) in order to see the area and to meet the president of the club. Chippen has declared that he was still waiting for an offer from Italy. All the transfer are in stand by in Italy until the 9th of July due to the scandal which involved many clubs. Exclusive pictures from Stora Valla from this historic victory. 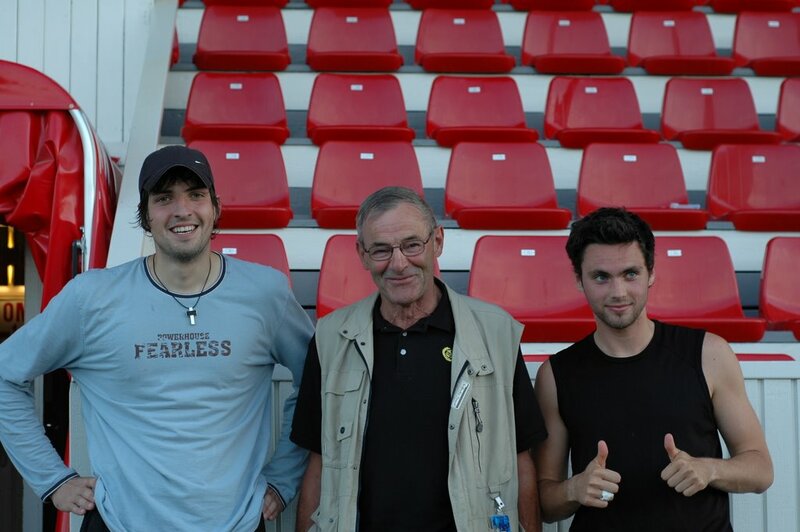 Dusan M. , Lasse J. and Alex M.after the victory. Marcus M. in action in front of the goal. The team just after the end of the game. 12 goals in 3 games. Mjällby has never scored so much since the begining of this year. After 13 games MAIF has the second attack of the league with 22 goals just after Örebro. 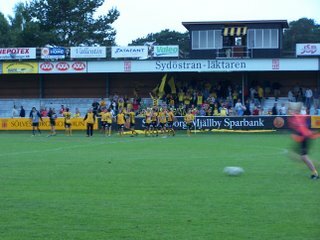 10 the place of Mjällby after 13 games. 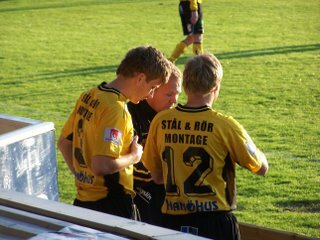 In 2005 Mjällby had only 6 points after 13 games. This year we have 17 points, 11 points more. 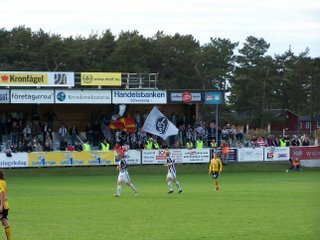 The post from the 17th of April "Mjällby AIF 1 – 2 Ljungskile SK: A year in the merde?" 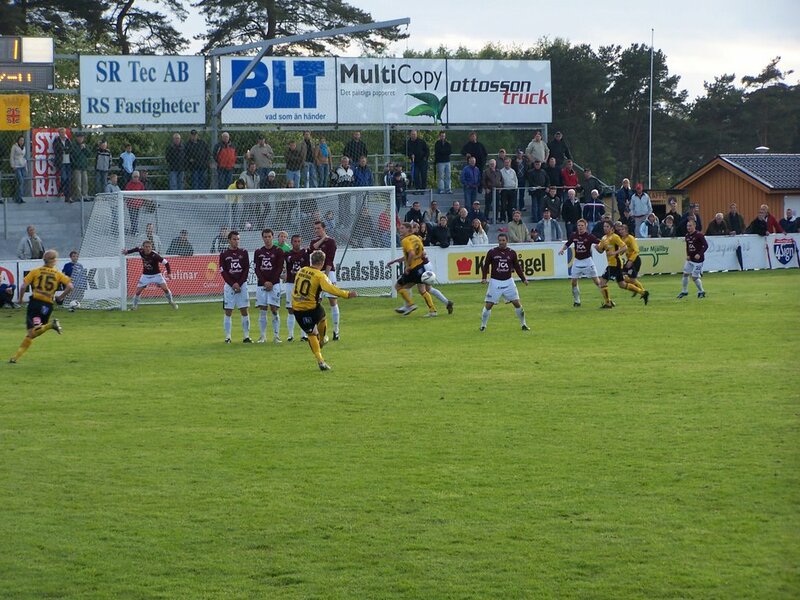 and the one from Friday 2nd of June "Mjällby AIF 1- 1 Qviding: What a shame" seem far. In case of victory on Sunday against Fallkenberg, we will have 20 points. We had to wait D24 last year to get 20 points! After a period of difficulties, the duo Persson-Andersson has found the right rythm. MAIF won 3-2 away in Degerfors tonight. Goals by Eken at the 4th minute, Simon at the 8th and Eken again at the 33rd minute. That's good news. We're now 10th of the league, 5 points above the black line. Keep winning MAIF! Plenty of yellow cards though, 5 total, so that's less good news. 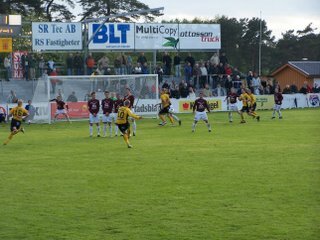 Next game on sunday home against Falkenberg. See you in Strandvallen! "The most popular player of Dynamo Budejovice, Martin Vozabal, moved to FC Slovacko. He packed his property and left his club on Monday morning. 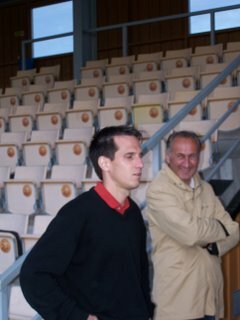 He got many offers, even from Sweden, but he gave priority to a profitable contract with FC Slovacko." As reported on the Dynamo Budejovice homepage this morning, Martin Vozabal will not come to Mjällby. He has signed for the FC Slovacko instead of the Lister club. 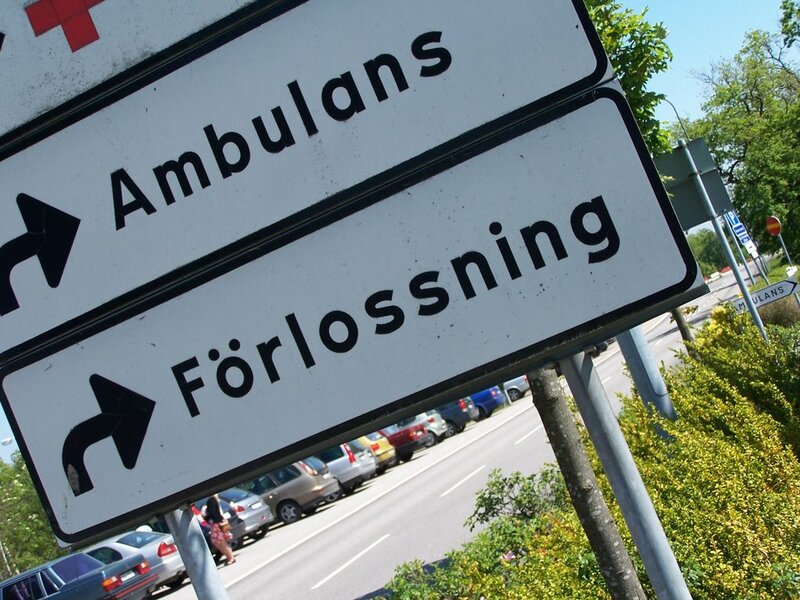 It´s a big disapointment because last week it was ok for MAIF at 99%, according to local media. .... or was it 99% sure that he should sign for FC Slovacko which had been reported on the mink forum last week ? Unfortunalty for Mjällby Vozabal has chosen to stay in the Czech republic. He leaves his previous club Dynamo Budejovice, who join the highest league next season, for FC Slovacko also in the first league. He has signed a 3 years-contract. 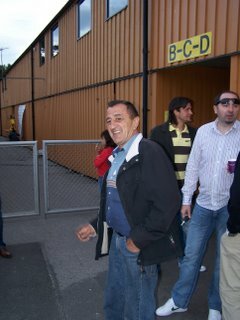 Slovacko was the same club were we found Dusan Melicharek. The Mjällby board has announced that they didn´t look at any other players than Vozabal since they where sure they would make the deal. Could this open for a return of Pavel Zavadil - the hero of last year? 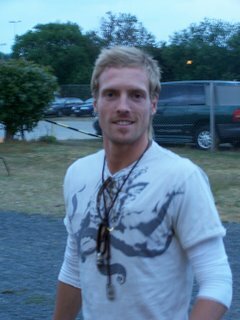 Since Sweden didn´t manage Germany in the 1/8 final of the world cup on saturday evening, "our own" national star - Chippen Wilhelmsson - made it on time to come home to see Mjällby - Umeå on Strandvallen, Hällevik, sunday evening. That is a true Maifare! Mjällby - Umeå 5-0: Simon like in Norway ! Fantastic victory of Mjällby against Umeå. Ok, it´s again a team from the bottom of the championship but several times this year and specially last year MAIF has had difficulties to win against "the small team" (... hum against the "big team also"). Repeated scenery during the game. 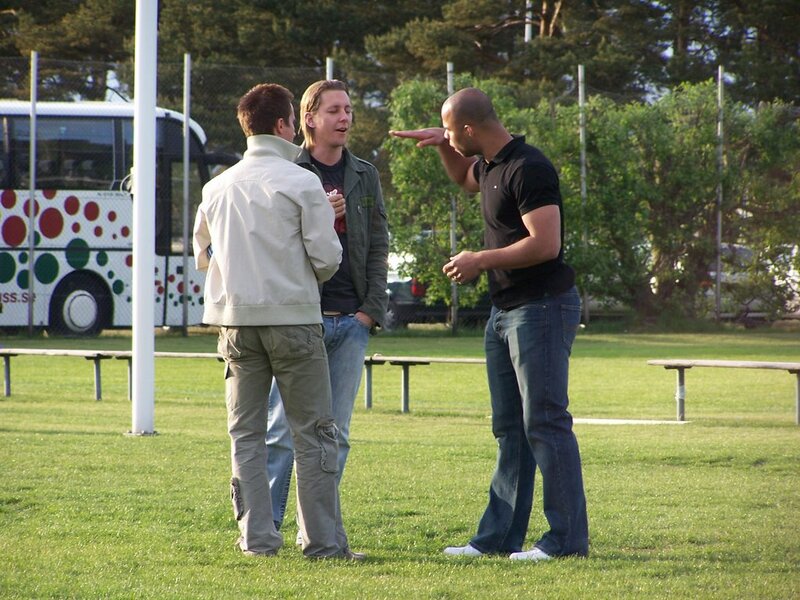 3 x Sjöfors, 1 x Svensson, 1 x Johansson. Hattrick for Sjöfors - and one missed penalty. 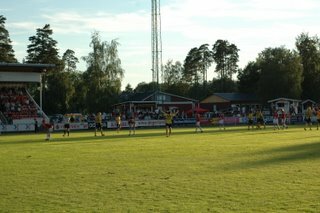 On Thursday evening Mjällby lost away, 5-4 against Norrköping. MAIF is put out of the swedish cup in 1/8 of final at the 91 minute... We will not have the opportunity to see an Allsvensk club in Strandvallen this year. The report in the local newspaper were poor. If it had been KAIF, journalists would have been sent for sure ! 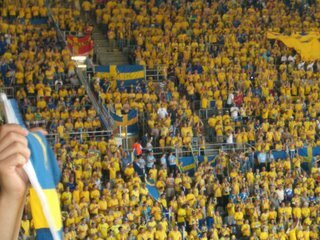 There is a complete lack of interest for the cup in Sweden as strange as it seems. In France, there is a passion for "La Coupe de France". 80 000 people saw the last edition and the victory of Paris Saint- Germain against Marseille in "Le Stade de France". 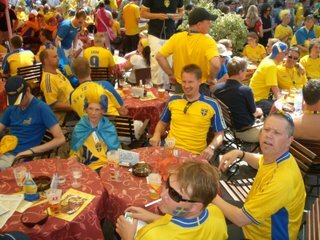 Here in Sweden it is very difficult to know the result, and even worse to know who was playing. It is not even reported that young Kim Thörnberg gave two assist in one of his first game with the A team. 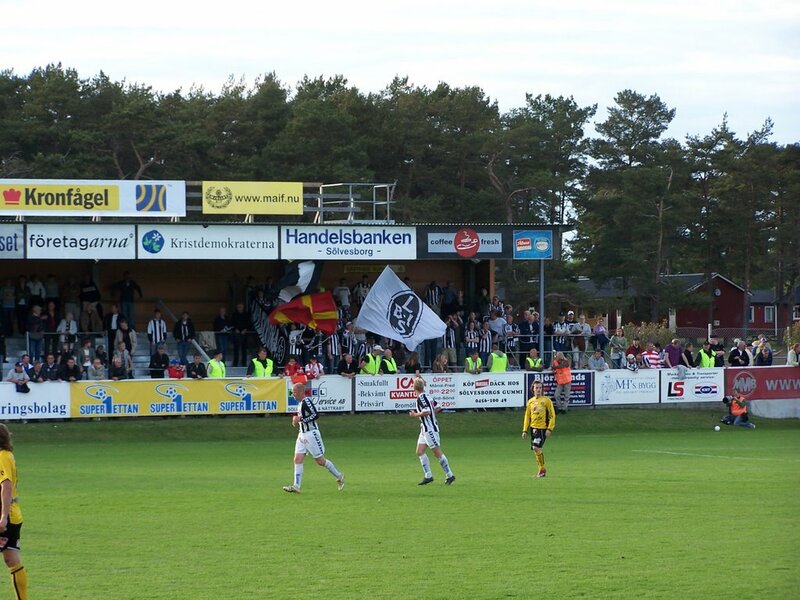 Below are the facts for the two previous game of MAIF in the Swedish Cup. 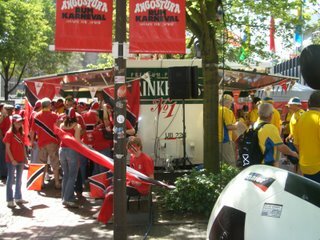 ValjeMinken was in Dortmund with a MAIF bus to see Sweden against Trinidad and Tobago (0-0 for the first game of Sweden in the world cup 2006) and has selected for the FrenchMinks site 4 exclusive pictures. 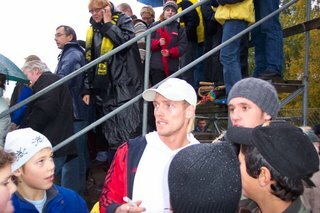 Supporters before the game in Dortmund. 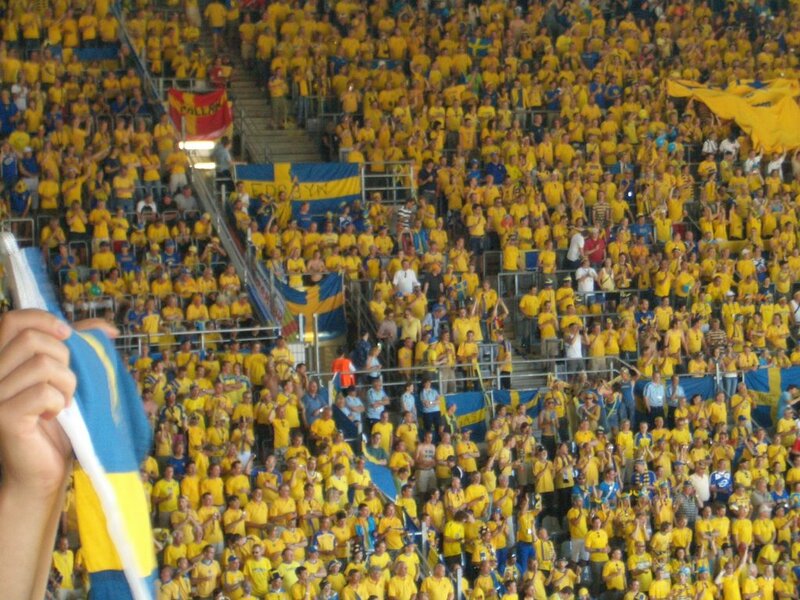 Picures from England- Sweden to come. Today in the belgian newspaper "La Dernière heure" Herman Van Holsbeeck, manager of Anderlecht, reports that Porto is also interested in "Chippen" Wilhelmsson. But the only club who has yet done an offer is still Nantes. He precises also that Nantes is now out of the negociation, because of the pricetag. Anderlecht wants 4 millions euros. The transfer of Chippen is followed in France since 3-4 months now and each time there is a new rumour, all the football site talk about it. Some weeks ago, Chippen was annouced to Paris Saint Germain. The interest from the supporters is really big. Today there is more than 400 posts on a forum about his transfer. Important point taken by Mjällby against Sundsvall. Sundsvall was leading 2-0. Simon Sjöfors reduced the score 2-1 and Alexander Malmström in at the 78 minutes scored after just 2 minutes. Hopefully it will give ideas to the trainers and Alexander will play more. News from Martin Vozabal... What´s going on ? 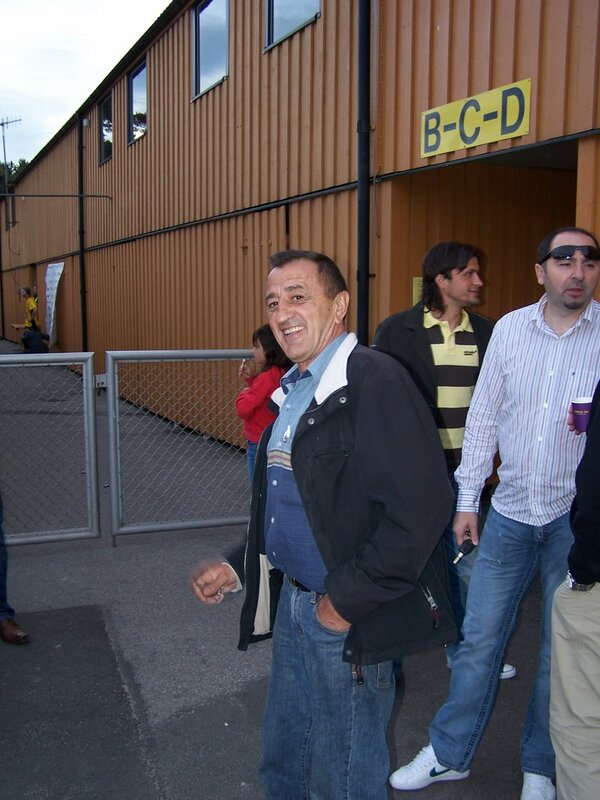 Some news about Martin Vozabal have been reported on the web site of Budejovice http://www.skcb.cz/clanek.asp?id=1655. The czech player had been presented by Mjällby during a press conference at Strandvallen just before Mjällby- Landskrona. He said that he went back home with a contract offer. He will now decide if he stays in czech republic and move to Slovacko or if he trys the mission in Sweden. 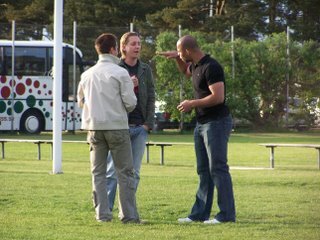 But he told the redactor that he was really satisfied with the condition in Mjallby: " I can choose my housing, i saw a match and i was really positive surprised when president of club gave me gifts for my children. It was really nice, but now i must discuss with my family about both offers". Martin Vozabal is estimated to 400 000 euros according to transfermarkt.de. Pavel Zavadil is only estimated to 175 000 euros. Dusan back in the start eleven againt Sundsvall ? On Thursday evening in Strandvallen the training finished by an opposition 11-11 and Dusan was in the A team while Felger was keeping the goal of the junior/b team. David Rehn and Peter Hiirsa have trained without problem. F. Olsson was not there as planned (injury). Stolen pictures of Marcus Senften (Kristianstad FF) and Daniel Niklasson (GAIS). Possible new czech player Martin Vozabal. 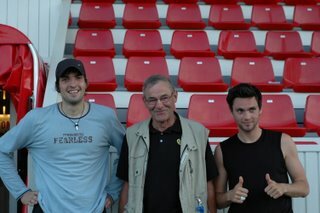 Pavel Zavadil visiting Dusan (in the back - sorry Radde). 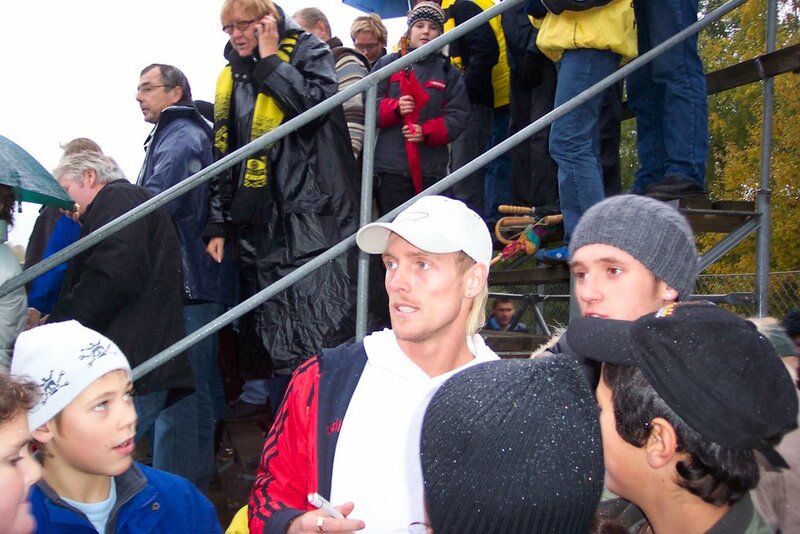 Chippen in Husqvarna - october 2004. According to the excellent French site www.football365.fr , Chippen is not yet transferred to Nantes. The sport director of Anderlecht Herman Van Holsdeeck has declared: " Nantes is interested but it´s more and more difficult for the team due to the good game of Christian against Trinidad and Tobago, Anderlecht has received two other offers (4 millions euros)". - Nice city in Bretagne. - Excellent football culture - "football a la nantaise". For example, the P16 are french champion http://www.fcna.fr/articles/20062007/flash-16anstitre120606.php. - He will be a star there. - He will win a lot of money because there is a lot of money right now in the French Football (canal + TV right one of the highest in Europe). - Nantes has been champion eight times (latest 2000-2001) and won the French cup three times . - Nantes has one of the best training school in France - Didier Deschamps, Marcel Desailly, Christian Karambeu. 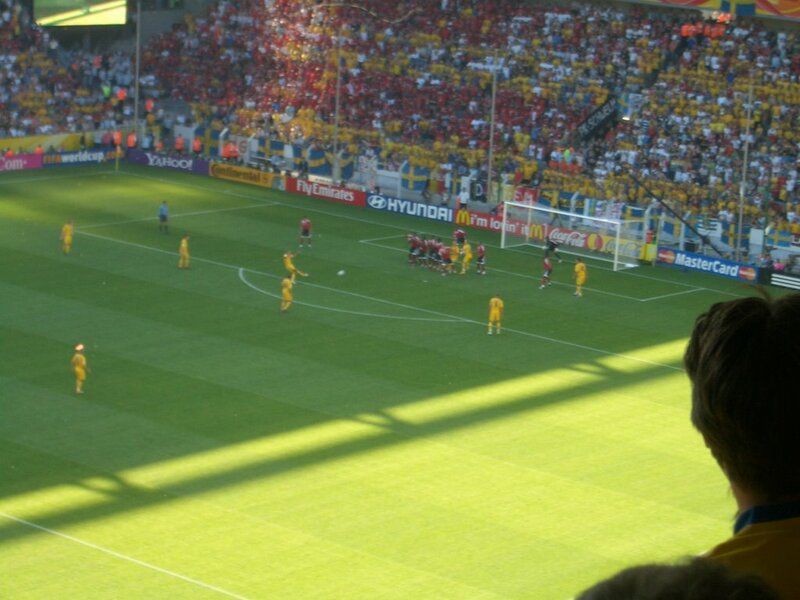 - Nantes is playing in yellow like Mjällby and the national team. No - Chippen should not go to Nantes. - The club finished at the 14th place last seasons. - Nantes is less ambitious than Rennes !! - Nantes will not play any european cup next year. - There is a risk than Chippen does not adapt to a specific Nantes way to play. Chippen should go to Paris ! This is the perfect club for him. 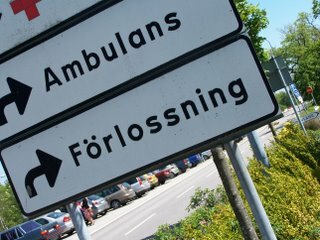 Landskrona Kop. Presentation of the team. 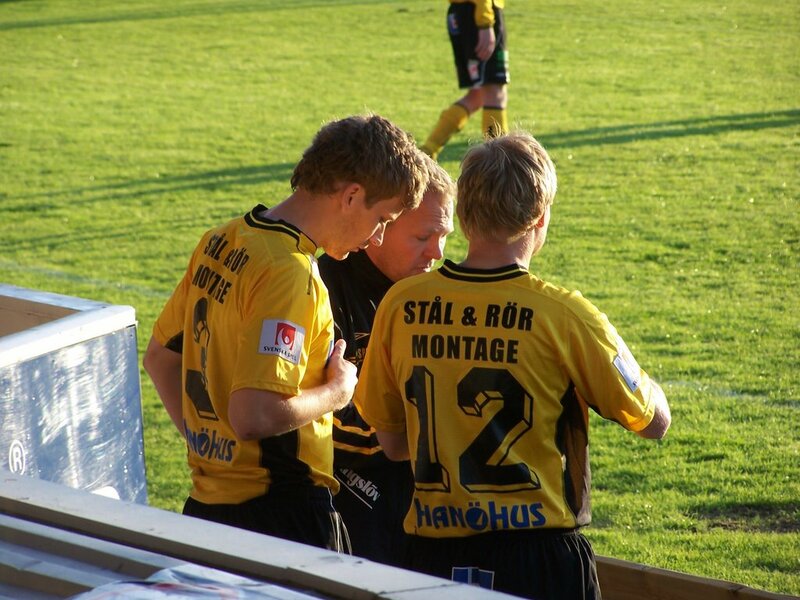 You were born on Monday and two days after Mjällby won with Landskrona 2-1 at home. It could not start better. 1 - I will not say bad things about the referee anymore during the game. 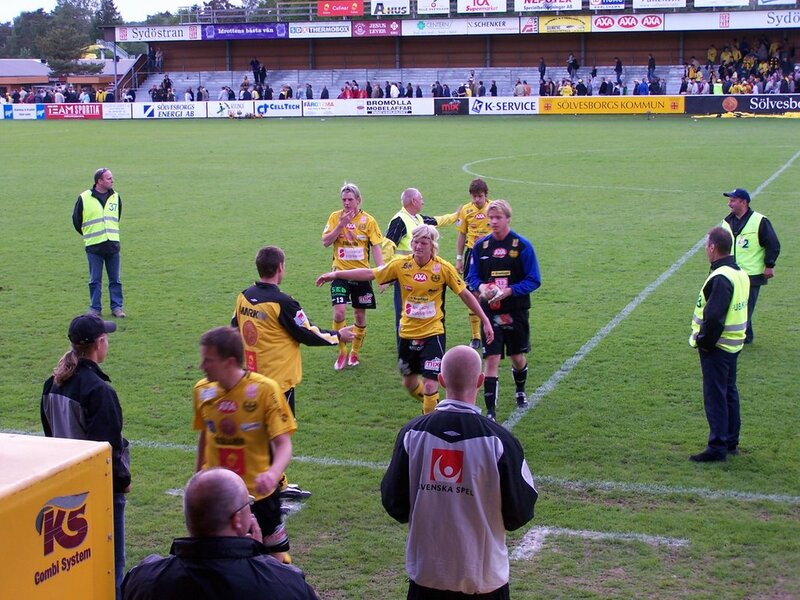 2 - I will not report that Mjällby has lost because the referee was bad. 3 - I will not critisise the 2 coaches because they know football better than me. 4 - I will not get upset anymore by the away coach. 5 - I will not take 2 times pasta anymore each time KAIF and Landskrona loose a game. Back to the game from last Thursday. 75 minutes: coaching. Too late ? if somebody has told me that before the game, I had probably laughed. Unfortunatelly, it happened tonight. We could take easily 3 points tonight, especially because of the first 20 minutes of the game, where Mjällby dominated the game. But like usually, we didn't kill the game like we should. On the other side, Qviding had one opportunity, and a put a very nice goal. A defensive too passive, a goal wrong placed, and here we are with one goal behind. After the break, Mjällby scored thanks to F. Olsson. Mjällby pushed at the end of the game, like usually, so the question is why always wait the end of the game, especially against Qviding which is not a best practise in term of football. We don't have to speak too much on the game, just remind that Mjällby had touched twice the post. My proposal is to keep one trainer (the most motivated if possible), and with the money saving, buy a striker. - Why always let play the same players, especially when they don't bring anything on the field. Why don't give a chance to Tobias Johansson and Alexander Malmström, that wait to show to everybody what they are able to do? Tobias, everytime he played, was dangerous and a "fighter". Why continue to play with Sjöfors who doesn't have any added value for the team. stupid faults when not necessary, slow, never placed at the right place. If we keep him because he scored one year 40 goals in the norwish league and because we think that he is a potential leader, then we can stop to dream. At one time, decisions and changes has to be made. F. Olsson who doesn't have this killer instinct like last year. The goal today is not representative of his game. he is still not in form. - we miss a real leader of the team. 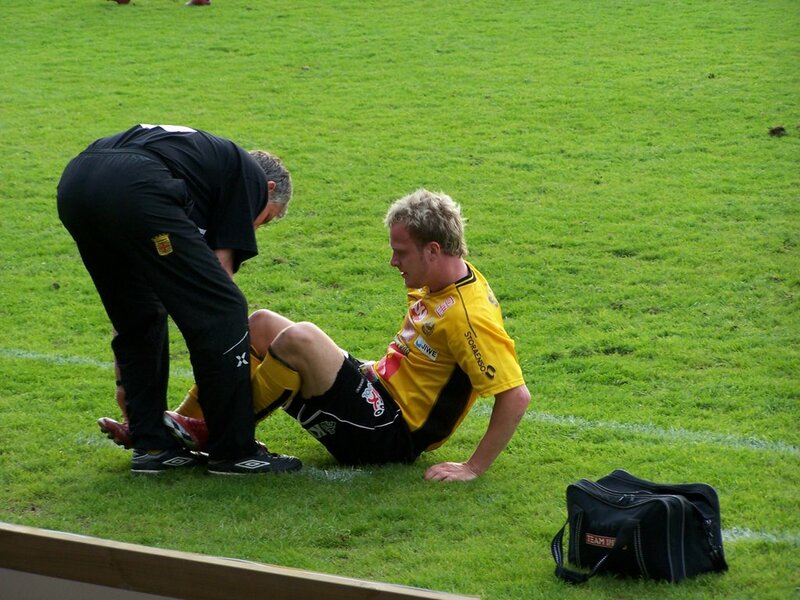 Hiirsa is injured, but I hope that he will come back soon. We are not able to beat a team like Qviding, we can have some doubts for the rest of the season. the situation starts to be catastrophic!!! 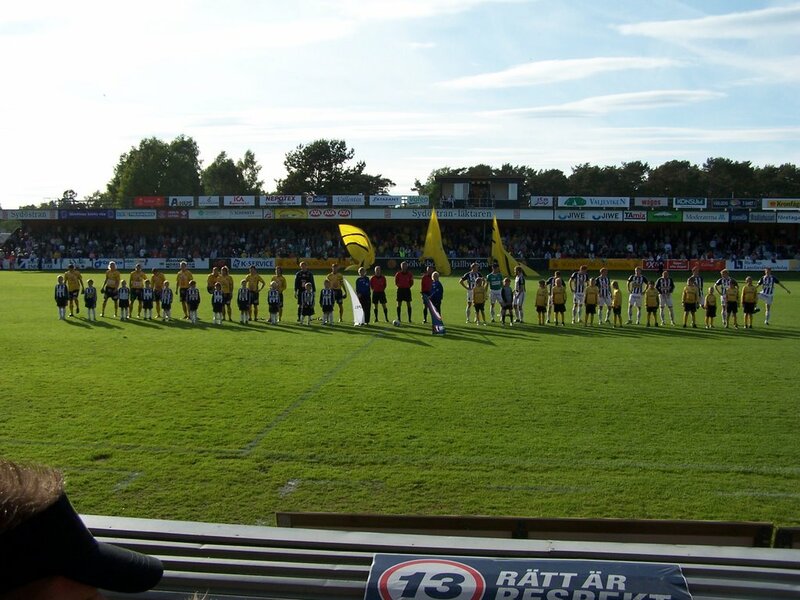 - Should we ask Mjällby AIF to pay back the season cards, because the spectacle that offers us the players and the trainers is a joke...at the moment. 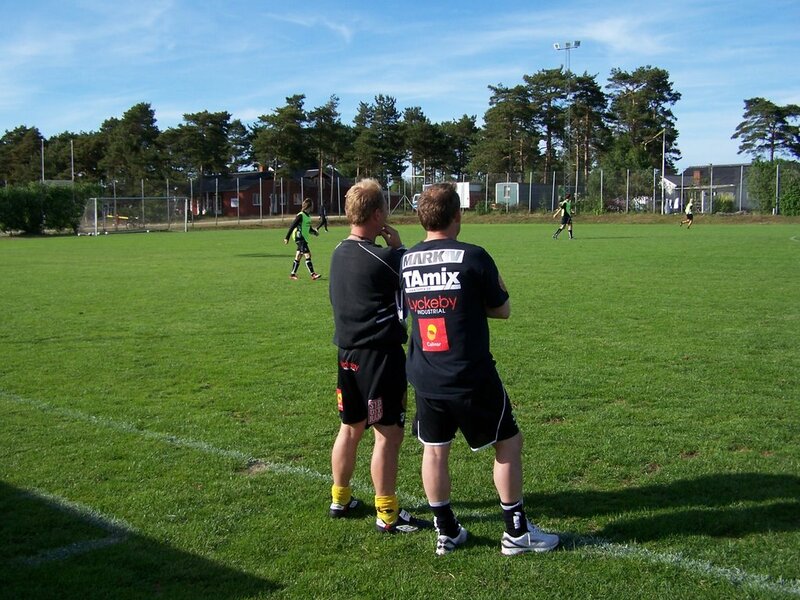 we can only hope that it will be better soon, for example next week against Landskrona. - Positive points: even with this ridiculous score, there are some positive points. Strandvallen were very pleased to see playing tonight Johan Svensson and Markus Ekenberg. lot of activity, dangerous, generous, physical. 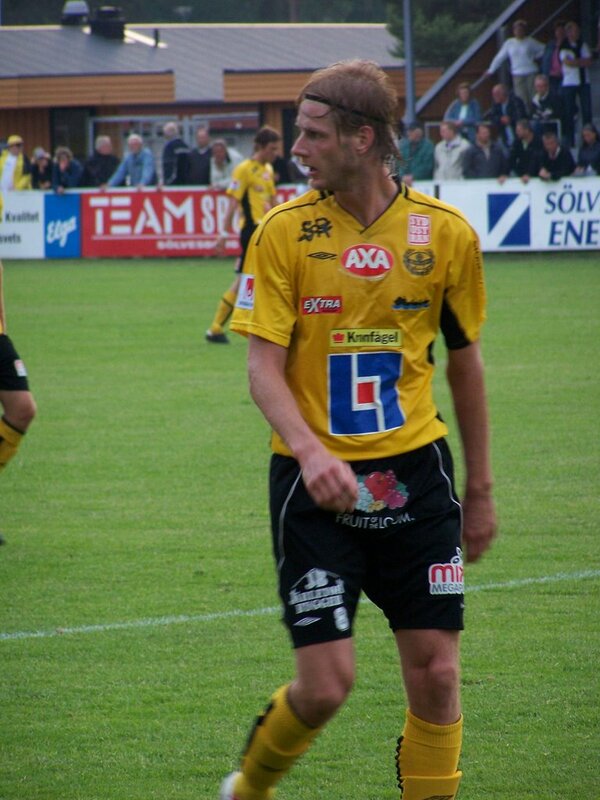 Daniel Nilsson and Johan Persson did a good game in the midfield. tired at the end of the game, but it is normal where you are playing a 4-2-4, you must run like for 2 players. Strubbarna is back also, very nice to hear them singing, and this is important and necessary. and the referee was good also...for one time.